The majority of date ideas are most suitable for during the day or early evening. However, a late evening date can be romantic and fun. Whether you're looking for first ideas for the person you just met or you need a 100th date idea to re-ignite the flame after years together, late night date ideas can be a lot of fun. Taking a stroll by moonlight illuminates the town in a completely different way and the far quieter atmosphere is conducive to some terrific conversation. Grab your significant other and go visit a quaint shopping area, or the neighborhood around your local coffee shop. Depending on where you live safety might be a concern, so try to find a place that does have at least a few other people roaming around as well. Nothing brings out someone's true character more than a little healthy competition and this is a late night date idea at home; no heading out required! To add a little spice to the night, the couple can come up with three fun challenges for one another. Simple ideas include cup stacking and solving Rubik's cubes, as well as more physical challenges like seeing who can do more situps in five minutes. When you have this idea in mind for a particular night, invite your partner to come up with several challenges and you should do the same. Put them all into a hat and pick out three at random. The winner of the home triathlon can then be awarded a prize, like a sensual massage or a day free from chores where the loser must do the laundry and mop the floor. Karaoke can be a private or a public affair. There are many karaoke bars across the country where volunteers can come up on stage in front of strangers to belt out their favorite songs. There are also several establishments in major cities where you can rent a private room with access to a huge library of songs. 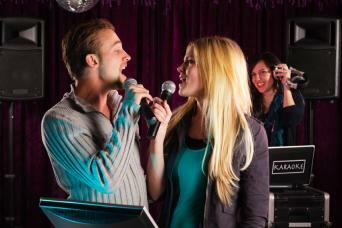 At home, there are games like Rock Band and SingStar that can provide a great karaoke experience too. Be silly, be romantic, or be everything in between during this late night activity. The stereotypical date consisting of dinner and movie doesn't have to take place during conventional hours. What's great about visiting a 24-hour greasy spoon diner in the middle of the night is that it generally isn't busy, which allows for more intimate conversation. Share a milkshake and have a great talk over some comfort food. What better way to end a romantic night of gazing up at the starry sky than to stay up until the wee hours of the morning to witness the sunrise together. Depending on the time of year, you may need to bundle up a little warmer or get out a little sooner, but it's well worth the experience. Research the best vantage points in your town to watch the sunrise together. These are often eastward-facing hillsides with unobstructed views or, if you're lucky, you may have an eastward-facing beach next to a large lake. The bar and nightclub scene can be seen as a place to meet new people and get connected with new romantic interests. They may or may not be the best place for a date. Alternatively, seek out the more relaxing social bars and lounges in your area. The music tends to be more mellow and the atmosphere is more conducive to relaxing. Enjoy some fancy cocktails and try to visit the lounge when there is live music. Most social lounges will have a schedule of events up on their website which will include a list of live performances. Many pool halls and bowling alleys are open well into the wee hours of the night, particularly on weekends. Some of these establishments may appear to be a little grungier and they can get shadier at night, so do choose a pool hall that is in the nicer part of town and appears to be a little more respectable for your safety. 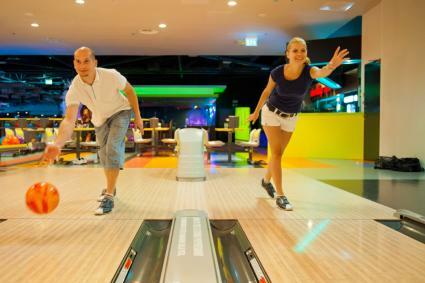 On the far brighter side, many bowling alleys offer glow-in-the-dark bowling later at night on Fridays and Saturdays, so check with your local alley to see if this is available. As with the home triathlon, playing some billiards and bowling can elicit some friendly competition. The cliche of learning how to line up a cue on a pool table cannot be ignored. Just like the moonlit stroll idea, no one ever said that you couldn't have just as much of a good time at the beach at night as you can during the day; it just happens to be a very different kind of experience. It will be cooler, so you will want to put on an extra sweater. Pack a light meal, a beach towel, and a lantern or some other source of light. Sit on the beach and listen as the waves come crashing in, all surrounded by the stillness and solitude of the night. This can be very romantic. Just make sure you check with local authorities to ensure that there are no restrictions against beach usage after certain hours. Late night dates are all about having fun in unconventional ways. Hold a spontaneous dance party by hooking up your phone or computer to a speaker if possible and create a fun playlist together. Spend the night learning each other's favorite songs and having fun dancing together. Learn how to bust a move like Shakira or follow some dance step diagrams if you both have two left feet. Use ingredients that you have on hand to make a few unique snacks or desserts together. Not only is this a great way to bond, but you may come up with something amazing. If your cooking experiment turns out well, your shared dish can become a sweet tradition that you continue to cook together. Build a fort together and throw in some extra blankets and pillows. Curl up inside and read a favorite book together. Take turns reading out loud to one another for a romantic reading. Light some candles and take turns giving each other massages. This is a relaxing way to unwind with each other. Use aromatherapy oils and have fluffy robes ready to relax in when you finish. Write a poem or song together. Take turns writing one line at a time and don't be afraid to make it silly! Record yourselves for posterity; you can upload it to social media if you want to share or keep it all to yourselves! One of the keys to a great relationship is the willingness to try something new. Late night dates can add a new spin on old ideas and they may encourage more romantic surprises too. Whether it's because of scheduling or just the desire to do something different, going on a date late at night can be a great idea.